Brand New w/ Craftsman Lifetime Warranty ~ Includes A Handy Carrying Case! You will always be ready to do your best work with the Craftsman 56-Piece Universal Mechanics Tool Set. Whether you are tightening or replacing your bolts, this 56-piece set has just the tool you need to get the job done quickly and correctly every time you reach under the hood. All 56 pieces come organized and protected in the signature Craftsman sturdy and durable lightweight red case. Inside the handy carrying case you will find the 56-piece universal mechanics tool set that includes both US customary units and metric units. In the universal tool set you will find nine customary sockets and nine metric sockets, a 3/8-inch drive ratchet, seven customary and seven metric wrenches, a 3-inch socket extension, a magnetic screwdriver socket with ten screwdriver bits and eleven customary measure hex keys. Brand New, Built To Last w/ The Incredible Craftsman Lifetime Warranty! Carrying Case Included: Pictured Red Carrying Case Included, Making It Easy To Transport Your Tools. 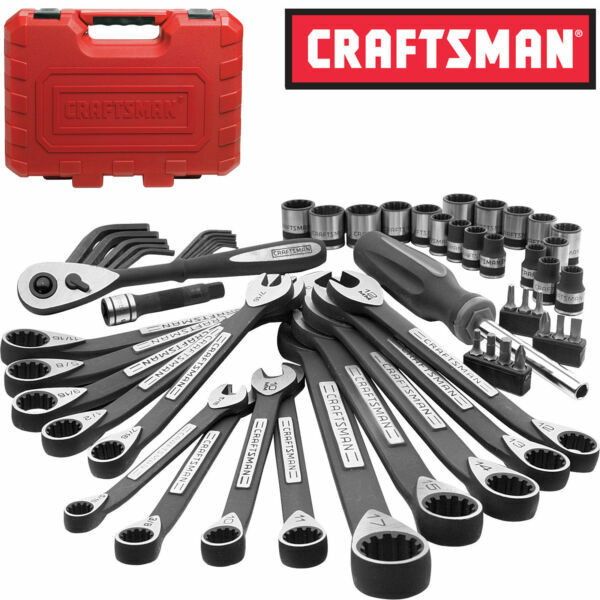 Superior Grip: The Entire Craftsman 56-Piece Universal Mechanics Tool Set Delivers Black Oxide Protected Tools Offering Better Gripping Ability. Signature Quick-Release Ratchet: Lets You Change Out Sockets Quickly & Easily; It Features The 45 Durable Teeth For Cranking & Fluidity While The Ratchet Turns On A Mere 8 Degrees Allowing You To Work In The Tightest Of Spots w/ Ease. Added Torque: Combination Wrenches w/ A 15-Degree Offset Provide You Added Torque w/ Every Turn.